Where lies Newcastle United's Rafalution? When Rafael Benítez became Newcastle United’s manager in March 2016, the football world was stunned. Now, after winning promotion from the Championship and guiding the club to a steady 13th place in the Premier League after a busy Christmas period, is the Rafalution complete? When the ex-Real Madrid manager received the phone call just under two years ago, Newcastle were 19th in the Premier League with just 10 games left to play and were in real danger of dropping into the Championship. At this point, you would expect any club in this perilous position to appoint a Tony Pulis-type manager - someone that would tighten up the defence and grind out the necessary results. However, perhaps for the first time in the Mike Ashley era, Newcastle showed ambition and went after Benítez. Perhaps the Spaniard’s acceptance of this offer was catalysed by a desire to be back in English football. It could also be said the that the fabric of Newcastle United and it’s following is not too dissimilar to that of Liverpool. Or maybe he simply saw potential where many saw an implosion. Whatever the reason, Rafa agreed to take the helm of the sinking ship, and even though that ship sunk to the depths of the Championship, he stayed onboard and masterminded an immediate ascension back to the Premier League. But what now? Whilst the former Liverpool, Chelsea, Real Madrid, Inter Milan and Valencia boss clearly boasts a stellar CV, is there much more he can do with Newcastle United? Until the club sees herculean investment, there is no prospect of Champions League, or even Europa League football in the near future. Should Newcastle avoid relegation, a realistic objective for the Toon Army next season is a top 10 finish and a decent cup run. Benítez, one of the most successful managers in football, surely cannot be attracted by such a prosaic forecast. 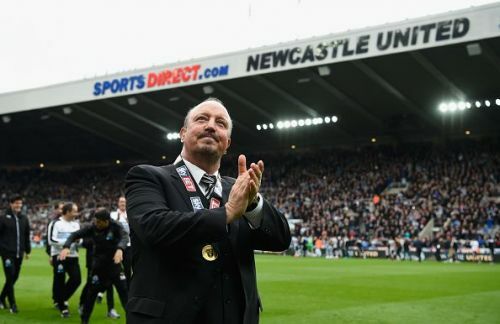 The impending change of ownership at Newcastle may offer a glimmer of hope for the black and white faithful who would undoubtedly mourn Rafa’s departure from the club. PCP Capital Partners, run by British businesswoman Amanda Staveley, are reportedly close to agreeing a £300 million fee with Mike Ashley. However, as January rolls on with no sign of any completed deal, tensions are mounting on Tyneside. If the negotiations broke down for whatever reason, the once highly anticipated January transfer window would surely deteriorate into yet another agonisingly disappointing one for United. Rafa was outspoken in his frustration after a less than fruitful summer transfer window last year. One can only speculate how much more frustration he will entertain before calling quits. Newcastle United need Benítez, but Benítez certainly doesn’t need Newcastle United. Furthermore, the Magpies boss will likely be inundated with offers elsewhere if he isn’t given the necessary resources this month. On the flip-side, if the change of ownership is successful and Rafa is afforded the funds he so clearly needs to improve the squad, there is no telling how far he could take Newcastle. There’s no escaping the fact that Benitez would bask in the inevitable admiration that would come with getting Newcastle back into the Champions League, where many believe a club of its stature truly belongs. Geordies would worship the ground he stood on if they were afforded the chance to see their beloved sleeping-giant go toe-to-toe with best teams in Europe once more. If this black and white utopia became a blissful reality, surely then the Rafalution would be complete.